The last year-and-a-half has provided plenty of evidence that the Russian government attempted to influence the 2016 presidential election. Unfortunately, most of the evidence confirming this has been delivered by entities outside the US government. The government has released reports but has omitted plenty of key details. This hasn't done much for those affected by Russia's efforts. In almost every case, individuals targeted by Russian government-directed hacking entity Fancy Bear were made aware of this by journalists, not the FBI, despite the fact both had access to the same evidence. The FBI refused to comment specifically on its disclosure efforts (or rather, the lack thereof). It offered no official excuse for its across-the-board lack of notification. Even the few that were notified could hardly be considered to be apprised of anything. Despite evidence otherwise, the FBI claims it "routinely" notifies people and organizations about potential threats. The statement it issued to the AP would sound credible if it weren't immediately disproved by results of the AP investigation. This lack of target notification dovetails nicely with the government's handling of other disclosure efforts. The government says the same thing about the hardware and software vulnerabilities its intelligence agencies exploit. It claims to be very forthcoming about vulnerabilities and yet exploits it never informed affected tech companies about have been repeatedly leveraged to attack computers all over the world. A senior FBI official, who was not authorized to publicly discuss the hacking operation because of its sensitivity, declined to comment on timing but said that the bureau was overwhelmed by the sheer number of attempted hacks. This doesn't explain why the AP was able to track down affected government employees and contractors -- using less personal information than the FBI has access to -- and inform those affected by Fancy Bear hacking. The AP unquestionably has less manpower available than the nation's largest law enforcement agency. Certainly limiting its notification efforts to just this hacking effort allowed the AP to complete this task, but even in the face of multiple hacking attacks, the FBI should have been able to provide more notification. The "there's too much to deal with properly" excuse doesn't even impress former Intelligence Community members -- people who definitely know about drowning in data. Phishig attempts aren't murders, but the underlying assertion -- there's too much happening to do anything about -- is still worthless. The FBI wants to be the go-to agency for national security issues as well as a key player in the cyberwar, but seems unwilling to perform the mundane, but necessary, tasks that accompany those noble pursuits. The boring parts of the job still need to be done. If the FBI seriously wants people to get behind its counterterrorism efforts and cybersecurity work, it needs to make a better effort getting behind the people affected by those the agency is targeting. When a mainstream press that isn't always good at what it does meets technology it doesn't understand, the end result is often frustrating, if not comedic. Hacking is certainly no exception, given it's a realm where perpetrators are difficult to identify, hard proof is often impossible to come by, and hackers worth their salt either leave false footprints -- or no footprints at all. Throw in a press that's incapable of identifying and avoiding its own nationalism, and often all-too-gullible to intelligence industry influence, and you've got a fairly solid recipe for dysfunction when it comes to hacking-related news coverage. Some of the resulting coverage has been highly entertaining -- such as CNN using a screen shot from the popular game Fallout 4 in a story about hacking and hoping nobody would notice. Other examples have been decidedly more troubling, such as the Washington Post's epic face plant over the holiday break. 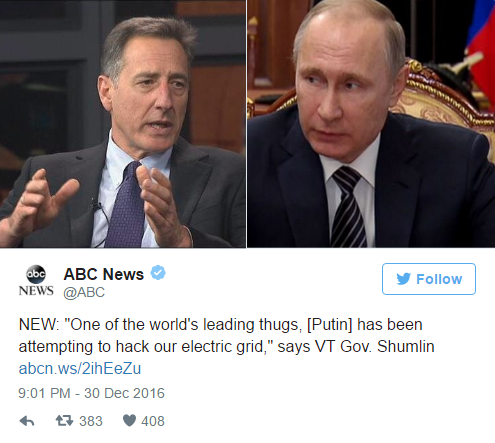 “Vermonters and all Americans should be both alarmed and outraged that one of the world’s leading thugs, Vladimir Putin, has been attempting to hack our electric grid, which we rely upon to support our quality-of-life, economy, health, and safety,” Shumlin said in a statement. “This episode should highlight the urgent need for our federal government to vigorously pursue and put an end to this sort of Russian meddling." Unsurprisingly, the story quickly gained traction in the media, with numerous reports pouring gasoline on the idea that Russia has escalated its cyber offensives to include targeting sensitive American infrastructure. Many broadly speculated that other utilities had been compromised and that we were at the brink of war. "An employee at Burlington Electric Department was checking his Yahoo email account Friday and triggered an alert indicating that his computer had connected to a suspicious IP address associated by authorities with the Russian hacking operation that infiltrated the Democratic Party. Officials told the company that traffic with this particular address is found elsewhere in the country and is not unique to Burlington Electric, suggesting the company wasn’t being targeted by the Russians. Indeed, officials say it is possible that the traffic is benign, since this particular IP address is not always connected to malicious activity." That's obviously a pretty far cry from the hysteria bouncing around the news wires as the new year arrived. Thanks, again, to news outlets that are all too eager to take the breathless claims of a few anonymous officials as gospel without doing the heavy lifting required to first ensure the information is useful, or accurate. As it turns out, the Post hadn't even bothered to contact Burlington Electric, which was forced to issue its own statement to the Burlington Free Press clarifying what happened, and making it clear the laptop was never in contact with any electrical system. All told, Burlington Electric had simply received a notification from Homeland Security sent to all utilities warning them to keep an eye out for particular malware. The company only found the malware and laptop in question after doing a scan off all of the company's systems. And as it turns out, the "Russian malware" in question could have simply been made by a Russian and purchased by anybody. Needless to say, the Washington Post then spent the lion's share of the next few days editing the story, changing the headline repeatedly, and walking back the story's claims. But most of the stories regurgitating the Post's original claims were never updated or corrected. Reporting on hacking isn't easy. Disinformation is everywhere, and many outlets continue to illustrate they're easily manipulated, thanks to a nationalism bias they're somehow still unaware of. But the Washington Post simply failed to do even the basics, inflaming notable tensions between two giant countries because it couldn't bother to pick up the phone. Yes, Russia hacks us (and uses propaganda against us and other countries) constantly. The United States does the same. Proof of either is often impossible to come by, but that still doesn't mean it's not required before jumping to conclusions. As tensions rise facts matter more than ever, and sloppy reporting only fuels those quite intentionally looking to take these often-dangerous and idiotic cyber-offensive policies to an entirely new level. As you almost certainly know by now, on Friday Wikileaks released a bunch of hacked DNC emails just before the Democratic Presidential convention kicked off. While Wikileaks hasn't quite said where it got the emails, speculation among many quickly pointed to Russian state sponsored hackers. That's because of the revelation last month of two sets of hackers breaching the DNC's computer system and swiping (at the very least) opposition research on Donald Trump. Various cybersecurity research firms, starting with CrowdStrike, which was hired by the DNC to investigate, pointed the finger at the Russians. Of course, whether or not you believe that may depend on how credible you find the big cybersecurity firms like CrowdStrike, FireEye and Mandiant (the big names that always pop up in situations like this). For what it's worth, these guys have something of a vested interest in playing up the threat of big hacks from nation-state level hackers. For a good analysis of why this finger-pointing may be less than credible, I recommend two articles by Jeffrey Carr, one noting that these firms come from a history of "faith-based attribution" whereby they are never held accountable for being wrong -- and another highlighting serious questions about the designation of Russia as being responsible for this particular hack (he notes that some of the research appeared to come pre-arrived at that conclusion, and then ignored any evidence to the contrary). Still, the claim that the data came from the Russians has become something of a story itself. And, of course, who did the hack and got the info is absolutely a news story. But it's an entirely separate one from whether or not the leaked emails contain anything useful or newsworthy. And yet, because this is the peak of political silly season, some are freaking out and claiming that anyone reporting on these emails "has been played" by Putin and Russia. Leaving aside the fact that people like to claim that Russia's behind all sorts of politicians that some don't like, that should be entirely unrelated to whether or not the story is worth covering. And yet, we already have stories arguing that "Putin weaponized Wikileaks to influence" the US election. That's ridiculous on multiple levels. Wikileaks releases all kinds of stuff, whether you agree with them or not. And the idea that this will actually impact the election seems... unlikely. Is the (not at all surprising) fact that the DNC is fully of cronyism and favoritism really suddenly going to shift voters to Trump? Of course, Wikileaks implicitly threatening someone with legal action for saying there's a connection between Russia and Wikileaks is pretty ridiculous as well. To some extent, this reminds me of some people who freaked out over the Sony Pictures hack, a while back. There the culprit blamed was North Korea, a claim that at least many people remained skeptical of. But, even so, there were some (including Sony) who tried to argue that no one should report on the contents of the emails because it would somehow support the North Korean regime's goals. Yes, whoever is behind such hacks is a story. But it does nothing to lessen or impact whether or not the leaked emails themselves are newsworthy. Arguing against anyone publishing stories about them just because they may have begun with Russian hackers is just a way of desperately trying to block embarrassing stories about the DNC from getting published. U.S. officials were alerted to the breach by an ally, sources said. Wait a second. After all we've been told about the brilliant minds at the NSA/US Cyber Command and their "cybersecurity" skills -- it seems immensely troubling that (1) the US didn't catch this themselves and (2) that some other country did catch it. So, uh, just why is some "ally" monitoring the White House's network? As for the rest of the report, as the Washington Post notes, this isn't even that big of a deal. Foreign state hackers are always going to try to breach US government computers, and sometimes they're going to succeed. That's the nature of the beast. But, it does seem profoundly odd that it was discovered by some other country. There's just one huge glaring problem with that. Snowden has absolutely nothing to do with the timing. Snowden gave a large pile of documents to Glenn Greenwald, Laura Poitras and Barton Gellman. Some of those documents have been shared with certain publications, including reporters at The Guardian, the NY Times and Der Spiegel. But as everyone who's been reporting on these issues has noted, Snowden has had zero input in what was being reported on and when. The "timing" has always been up to the various publications. So, based on McCain's claims, he is actually suggesting that the NY Times and The Guardian, among others, are actually "working for Russia" and taking orders from Putin on when to publish certain news. I would think that even among the wacky conspiracy theorists out there, such a contention is plainly idiotic.